Welcome to SNHU, where holiday performers learn, share, encourage, and connect with others to nurture their craft. Whether a Mrs. Claus, Elf, or Santa, it takes more than putting on a red dress or suit to become a great character. When we reflect on our own Christmas memories, something deep within us is triggered each time we portray our character. It starts from within and it is simply why we do what we do. SNHU is your partner on your journey. Over two days, experience our interactive and hands-on approach to developing your character and performing in an evolving Christmas community. We welcome new and experienced performers, women and men, and all holiday characters. Learn to rock your role from the inside out! Judi lives in Beloit, WI with Santa Laureate. She is a member of Wisconsin Santas, IBRBS, Illinois Santas, and recently became a Knight of St. Nicholas. She is a graduate of C.W. Howard School for Santas and Mrs. Claus, Tim Connaghan’s International University of Santa Claus, and the St. Nicholas Institute. 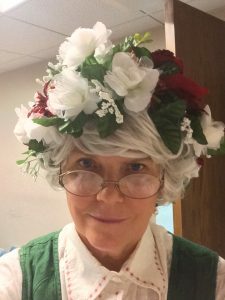 Judi has attended and taught at numerous workshops and conferences, and at the 2018 IBRBS International Santa Celebration in Denver. Judi was selected as the ClausNet Member of the Month for August 2015. Deanna lives in Cave Creek, AZ, with her husband Kim, and is an independent performer. 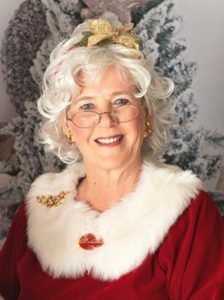 She serves on the IBRBS Board of Directors, as well as, the Board of the Arizona Santas, Mrs. Claus & Elves. She is a graduate of Tim Connaghan’s International University of Santa Claus, and Santa True’s Christmas Performer Workshop. Deanna has attended and taught at local workshops, and at the 2018 IBRBS International Santa Celebration in Denver. Deanna was selected as the ClausNet Member of the Month for December 2018.